You may have entered a Wrong Registration Number. Your Registration Number does not belong to B.TECH./B.PHARM. Your College may not have sent the Internal/Laboratory/Practical marks to the University. Please contact your college in this case. Your Result may be Blocked due some reasons. 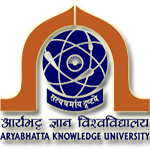 Your College may not have an affiliation with ARYABHATTA KNOWLEDGE UNIVERSITY, PATNA. The results published are provisional and subject to change after post publication scruitny by AKU. AKU is responsible for any inadvertent error that may have crept into the results being displayed.